Val Thorens, voted No. 1 French resort on Snowplaza! You are here:HomeBlogVal Thorens, voted No. 1 French resort on Snowplaza! The skiers’ and snowboarders’ verdict on Snowplaza is clear: the best ski resort in France is Val Thorens! The highest ski resort in Europe already won the coveted title of 'Best Ski Resort in the World" in 2013 and 2014 in the World Ski Awards, so this new title is not a surprise and simply confirms the incredible versatility of this top-notch resort in the Three Valleys. Here are, in our opinion, the 10 major assets of your favorite ski resort. 99% of the ski slopes of Val Thorens are located above 2000 meters of altitude! This fact may seem impossible, but it is completely true! It goes without saying that at such high altitudes, snow is guaranteed from November to May. This winter, Val Thorens treats us to an exceptionally long ski season as it is the last ski resort to close in the French Alps. You can enjoy skiing in Val Thorens until Sunday, the 10th of May! The Michelin Guide, which cannot be suspected of being bias, is categorical: the “Cime Caron”, the highest point in the Three Valleys at 3200 meters, easily accessed thanks to the cable of the same name, offers “the most beautiful view in the Alps". If you have the time and the patience, you can actually count more than 1000 different peaks from the Mercantour to the Swiss and Italian Alps. No photo this time – we’ll let you discover this view for yourself! Val Thorens is well aware that tourists come to the mountains not only for the skiing and snowboarding but also to enjoy the fresh mountain air and so the resort makes an effort to preserve its precious environment. The center of Val Thorens is actually mainly pedestrian and cars are parked in discreet car parks under the buildings to preserve the visual image of the resort and to limit pollution. This winter, Val Thorens has commissioned a second hybrid snowcat for even fewer nasty smells and bothersome noise on your ski holidays. 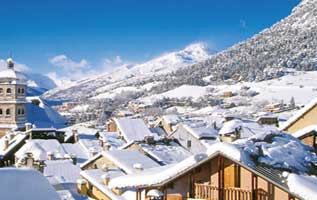 Val Thorens is famous among skiers and snowboarders for its altitude but also for the scope and quality of its ski area. The resort itself can already boast 150 kilometers of pistes, but when you consider it is connected to its famous neighbours Meribel, Les Menuires and Courchevel to form the Three Valleys ski area with over 600 km of slopes, it’s no surprise that you’re skiing in one of the best areas in the world! Val Thorens is clearly emerging as a leader in apres-ski and nightlife among the French ski resorts. While at La Folie Douce up on the slopes, for the fifth season running the party gets going from 2.30pm, other apres-ski hot spots take over in the evening. Between the numerous pubs, apres-ski bars and trendy nightclubs in Val Thorens, the hardest job will be choosing where to go! We recommend the Altapura for its outstanding interior decoration or spending a night in a yurt at the Chalet de Marine for a really unique experience. A frequent misconception when referring to large, world-famous ski resorts is that the skiing is only for the experts. Val Thorens has plenty to offer experienced skiers and snowboarders of course, but children and beginners have certainly not been left out! 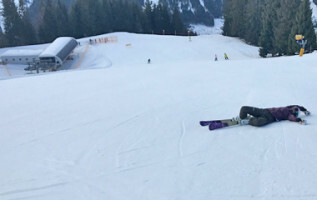 A 10 hectare "no stress" area has been secured where beginners and children can gain confidence safely without worrying about more experienced skiers. There are a total of 4 magic carpets and 11 green runs to enjoy. There’s no better way to learn to ski or snowboard safely. Val Thorens could rely solely on the quality of its skiing to attract tourists, but this top-notch ski resort decided to diversify its attractions. The proof of this intention was the recent opening of a huge aqua club and sports center, which in addition to a large swimming pool, offers a panoply of sporting, relaxation and family activities to enjoy after a challenging day on the slopes in Val Thorens. Val Thorens is a purpose-built ski resort which means that its facilities and accommodation are immune to aging, especially as the resort invests heavily each winter to stay up-to-date in all areas. For example, no less than 20 million euros have been spent this winter to improve skiing traffic in the Boismint and Portette sectors. On the accommodation front, whether you count the new MMV Les Arolles holiday club or the Hotel du Hameau du Kashmir, which just won its fourth star, quality accommodation is what you’ll find just about everywhere in Val Thorens. The greatest gastronomic names in France have caught on to the fact that skiers and snowboarders love to treat themselves to some delicious French food while on their ski holidays. These top chefs are reinventing French gastronomic tradition and in Val Thorens, there are 2 Michelin-starred restaurants that you must try: the 2-star Jean Sulpice, and the 1-star Epicurean. Note that further down the valley in Saint Martin de Belleville, La Bouitte just won its third Michelin star! 10. Val Thorens is home to the highest zip line in the world! Already well known for its superlatives, Val Thorens recently added an extra line on its list of records. A zip line 1300 meters long, reaching 100 km/h at peak speeds at 250 meters above the ground: these figures probably send a shiver down your spine! Starting from the “Cime Caron” at 3200 meters of altitude, the view (for those who dare to open their eyes) is breathtaking as you fly over the glacier on your way down to Orelle. This is an absolute must for those looking for an adrenalin rush on their ski holidays in Val Thorens! One of our Fave resorts - can't beat it! gets a bit chilly in mid winter though- highly advise going in the spring. Not surprised it got voted number one - it's a stunning resort with amazing skiing and acces to some of the best off-piste I know. We go every year and never regret our choice. Skiing was something that was sort of forced on me as a child. When my parents signed me up for the school ski trip when I was 11, I think I sulked for a whole month! However, I have no idea how to thank them as I haven’t looked back since!